Yuletide overindulgence on the poison front . 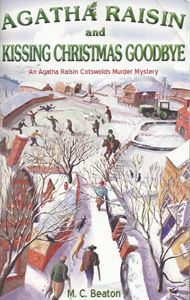 . .
During the dark, grey days of early December Agatha is obsessed by two things - the loming festivities, and her ex, James Lacey. In order to drive the latter from her thoughts, Agatha concentrates on planning the perfect Christmas for her friends. Even the murder of a Mrs Tamworthy, poisoned with hemlock, does little to distract her and yet it should, as Mrs Tamworthy had written to Agatha, telling her that one of her family wanted to see her dead before the year was out. So slightly guiltily (and belatedly), Agatha sets out to solve the case before the 25th rolls around . . .